Its a cold, rainy day here in the Midwest today. I am going to have this simmering in my crock pot today...so thought I would share. Quite possibly one of the best soups I have ever had. And it makes your house smell fabulous! I sometimes use a rotisserie chicken from the grocery store if I am in a hurry. 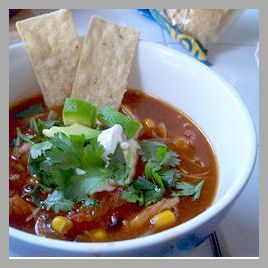 Place onion, chili beans, black beans, corn, tomato sauce, beer and diced tomatoes in your slow cooker. Add taco seasoning and stir. Lay your chicken breasts on top of the mixture, and press down until they are covered. Set your slow cooker on low...and cook for 5 hours. Remove Chicken breasts and shred with 2 forks. Return the shredded chicken to the soup and stir. Cook for 2 more hours on low. Serve with shredded cheese, sour cream and crushed tortilla chips. someone else posted taco soup! from denmark! thanks for the recipe! and at least it's not 40* here eh? THat looks so yummy! Mary, I see your an IL girl by your profile. Where are you at? That looks like a good one! I could eat soup everyday in the fall and winter! Hey Mary I stopped back by to copy this recipe down - I'm gonna try it today! Thanks! !